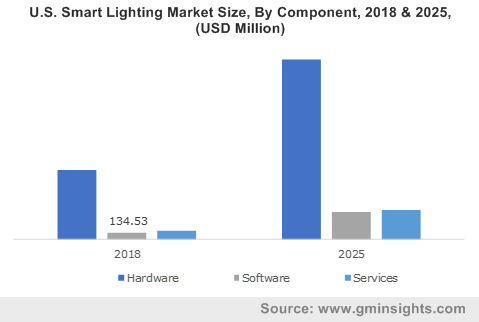 Smart Lighting Market size was estimated at over USD 6 billion in 2017, growing at a CAGR of over 20% from 2018 to 2024. The growing demand for energy-efficient lighting systems is characterized by the increasing need for reducing energy consumption in the residential as well as the industrial sectors. Energy-efficient LED lighting systems enable reduced energy bills for residential customers, resulting in the mitigation of the impacts of increasing tariffs on them. For industrial customers, these lighting systems reduce the cost of electric supply and peak load reduction. Government initiatives for developing smart cities around the world are majorly contributing to the rising demand for smart lighting solutions. Connected lighting systems are expected to emerge as one of the most critical components of the smart city infrastructure by contributing largely to the sustainability goals of the projects. As the lighting systems optimize city-wide energy consumption, urban economic self-sustainability and growth can be considerably accelerated. Additionally, increasing popularity of Li-Fi networked communication technology is expected to drive the smart lighting market during the forecast timespan. The smart lighting product segment dominated the component market in 2017 due to the large-scale installation of lighting systems by residential and commercial sectors to benefit from the convenience of remotely operating the smart lights along with the customization options available for the lighting systems. As companies are consistently introducing new products for the residential market, the installations are expected to largely increase over the forecast timeline. Within the product market, luminaires are expected to exhibit the fastest adoption over the forecast period and eventually hold a major smart lighting market share by 2024 due to rapid technological advancements in smart bulbs and fixtures by the market payers. As the companies are offering a wide range of innovative smart bulbs and fixtures at competitive prices, the installations are expected to increase swiftly between 2018 and 2024. The wired technology segment in the smart lighting market is expected to hold a significant market share of over 60% by 2024. As the technology offers high reliability and control over the lighting systems, the demand for different modalities such as DALI and PoE is likely to increase significantly between 2018 and 2024. On the other hand, advancements in wireless technologies, such as Bluetooth, Zigbee and Wi-Fi, and the growing adoption of IoT-based smart sensors for smart city applications are expected to accelerate the growth of wireless communication technology market during the forecast period. The LED segment is projected to hold a majority share of the smart lighting market by 2024 accounting to over 60%. As LED technology has emerged as a cost-effective and energy-efficient alternative to traditional incandescent lighting systems, the adoption of LED bulbs has rapidly increased over the past five years. Also, due to the availability of government subsidies and rebates for purchasing LED bulbs in various countries including China, India, and the U.S., the LED market is projected to exhibit a robust growth over the forecast period. Indoor lighting applications held a dominant share of the smart lighting market in 2017 due to the high adoption of connected lighting systems, especially for the residential and commercial applications. As customers in the residential market are becoming increasingly aware of the benefits of smart lighting systems in terms of reduced electricity bills, the demand for such lighting solutions for home and building automation systems is likely to increase rapidly over the forecast timeline. Outdoor lighting segment in smart lighting market is projected to exhibit the fastest growth between 2018 and 2024 with a CAGR of over 25%. The rapid growth will be characterized primarily by growing demand for smart streetlight systems around the world. As such systems can intelligently switch on/off based on the level of traffic and the availability of the natural light, significant energy savings can be realized through their deployment. Smart city projects can also largely benefit from these lights for realizing their energy security and sustainability objectives. Europe is projected to hold the highest market share of the global smart lighting market by 2024. The majority market share is attributed to a large number of ongoing smart city projects, high deployment of smart lighting systems in government, residential, and commercial sectors, and stringent government regulations for energy-efficiency requirements of lighting systems. Asia Pacific smart lighting market is projected to exhibit the fastest growth over the forecast period. Government initiatives to encourage the adoption of energy-efficient lighting systems are expected to majorly drive the smart lighting market growth. For instance, the UJALA Scheme implemented by the Government of India is focused on enhancing the awareness among consumers about the efficacy of energy-efficient LED lights. Under the scheme, consumers can purchase LEDs through an EMI payment model. Companies operating in the smart lighting market are mainly focusing on product innovations and new product development strategies. These companies are investing heavily on the research and development for advancing the smart lighting technology to introduce connected lighting solutions for applications ranging from home & building automation, smart cities, and smart streetlighting. Also, strategic collaborations for strengthening product development capabilities and expanding regional market presence are also contributing to the rapid innovation in the smart lighting industry. 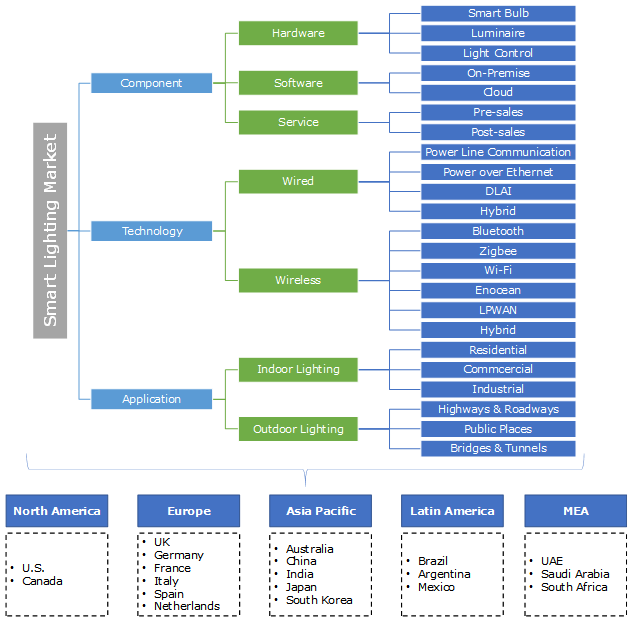 Some of the key players operating in the smart lighting market are Acuity Brands, Bridgelux, Cooper Industries (Eaton), Cree, Digital Lumens, Echelon, OSRAM, GE Lighting, Philips Lighting, Honeywell, Hubbell, Schneider Electric, Legrand, Lutron, Tvilight, Secil, Zumtobel, and Silver Spring Networks. Smart lighting offers critical benefits for residential, industrial, commercial, and government sectors that include energy efficiency, reduced maintenance costs, enhanced asset-security, and improved accessibility. They offer users the opportunity to remotely access their lighting systems anywhere, anytime, through smartphone-based applications. In smart city infrastructures, operators can proactively predict streetlight replacement needs and power outages and can achieve improved field efficiency. By leveraging the capability of LED lighting, connectivity, sensors & controls, and analytics & intelligence, enterprises can successfully achieve the lowest electricity cost.